To enable you a low cost and easy access to our photonic integrated circuit technology, we offer regular scheduled Multi Project Wafer (MPW) runs in the TriPleX™ technology. This Photonic Integration platform is suitable for components for telecom/datacom in the infrared (1550nm) region, as well as in life science applications in the visible range. The TriPleX™ waveguides offered within the infrared MPW are designed for single polarization (TE) applications to operate at the telecom wavelength (1.55 µm). The waveguide is also transparent for lower wavelengths. 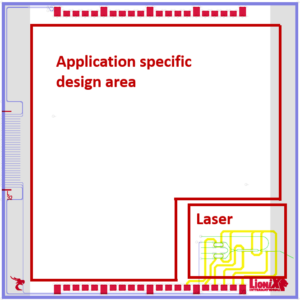 The TriPleX™ technology has applications from 405nm to 2.35µm. In addition, these waveguides show a low propagation loss. The high contrast waveguide allows bend radii of 125 micron, which makes large scale integration (VLSI) on chip possible. 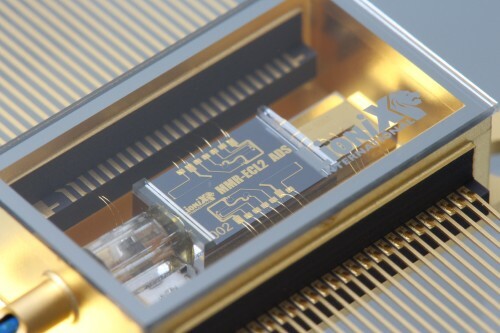 The coupling to and from a fiber from this high contrast waveguide is optimized by the addition of spot size converters , which expand the mode profile to the size of a standard telecom fiber, allowing low loss fiber chip coupling. The MPW offering includes a process design kit (PDK) containing validated and specified building blocks. These building blocks are a good start to a design and allow the user to create many new functionalities. Now our MPW offering has been extended with a tunable laser building block. The building block provides the user with a narrow linewidth source. As with all other building blocks offered in our PDK, it allows the user to easily connect the items together and create a customized or application specific design. If you are interested in the current tunable laser building block specifications, please contact us. By offering the tunable laser building block, the MPW user gets access to our well known low-loss waveguide platform TriPleX™. Moreover our unique hybrid assembly method of attaching InP gain section to our PICs now becomes easily available for designers using the PDK.